Pictures depicting three different tasks (display, preening and feeding) the Atlantic puffin (Fratercula arctica), one of the 176 bird species studied in the article, accomplishes with its beak. 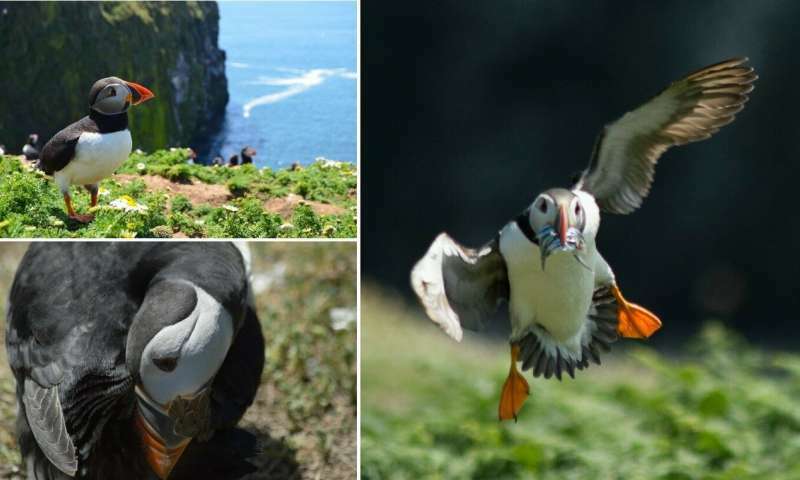 Credit: Photographs were taken by Sergio Martínez-Nebreda and Paula Medina-García in Skomer Island over the summer months of 2017 and 2018. Guillermo Navalón, lead author of the study and a final year Ph.D. student at Bristol's School of Earth Sciences, added: "The connection between beak shapes and feeding ecology in birds was much weaker and more complex than we expected and that while there is definitely a relationship there, many species with similarly shaped beaks forage in entirely different ways and on entirely different kinds of food. Co-author, Dr. Jesús Marugán-Lobón from Universidad Autónoma de Madrid, said: "These results only made sense when you realise birds use the beak for literally everything! Dr. Jen Bright, co-author from the University of South Florida, said: "We have seen similar results before in birds of prey, but this is the first time we studied the link between beak shape and ecology across all bird groups.